If you’ve seen any of my DIY projects from previous posts, you know that I like primarily one thing when it comes to DIY projects - easy! 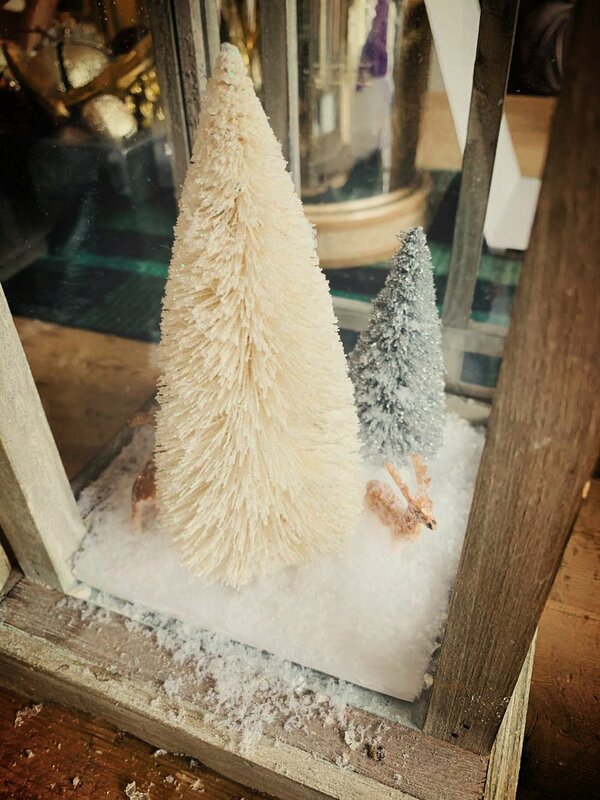 When I was out shopping last year, I saw some of these cute little winter scenes in glass containers. I didn’t buy any but was hoping I would remember to try it this year as a DIY. I love the look of lanterns, so I decided to head out to HomeGoods and find one. I love their lanterns because they aren’t too expensive and there as so many different styles to choose from. I bought one because I liked the lighter wood and the galvanized top, but whether you like white, black, dark wood or galvanized I think they would all turn out great. It’s whatever blends in your décor or the look you like. I also liked this one because two of the sides were plain glass versus having panes. I then headed over to Michael’s and picked up some bottle brush trees. These were in a set, and I had a few left over. They also have them individually if you don’t want a whole set. They had green, white or the set I bought were a mix of grays and creams. I also picked up some “snow” and two deer. They had so many miniature objects, it was hard to pick. Don’t forget your coupons but right now most things are 50% off anyway. I’ll tell you what you need, but you can really customize this to any scene you want to create. And you can put into any glass vessel you have on hand, and it could even be a small mason jar scene. Be creative and use what you have at home first. Measure the bottom of the lantern, and trace those measurements onto a piece of white foam board or cardboard. Cut and make sure it fits inside lantern. Cut square of white batting or felt. Attach with glue dots to foamboard. Attach trees and figures to batting or felt with glue dots. Slide scene into lantern or vessel. Sprinkle loose snow on top of scene. Close door. Tie ribbon on top of lantern. I kept mine pretty simple, but you really can put anything in this. You could even put in fairy lights if you want to light it up. I hope you will try this or some variation of this project. Its so easy, the kids can help or do their own. Have a great day and thanks for stopping by!